LAHORE: The Punjab government has been urged to show flexibility with regard to the moisture content level of wheat, which is being purchased in the ongoing procurement campaign, keeping in view successive spells of rains in recent days. Punjab�s wheat farmers are being burdened by the procurement specifications of 10 percent moisture content, Hamid Malhi, president of Wheat Growers Association, said here Wednesday. It is impossible for a majority of wheat farmers to conform to the procurement specifications in the current wet weather conditions, he added. �This could lead to rampant corruption and cause trouble to the farming community,� he said. The food department should revise the moisture limit to 12 percent to facilitate farmers. 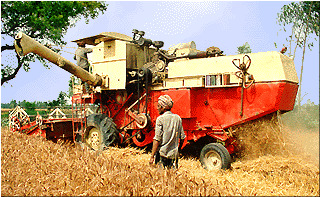 The permissible moisture level in wheat, being procured by the Food Corporation of India, stands at 12 percent. Farmers in all the states, including Indian Punjab, Hariana, Rajasthan, etc. are selling wheat to the public sector enterprises as per the much relaxed moisture contents. However, according to Captain (Retd) Muhammad Usman Younis, director of Food Punjab, revising the moisture limit is not possible under the existing government policy. He claimed that wheat stored above 10 percent moisture level is not safe and could develop aflatoxin, which is harmful for the consumption of human beings and is also prone to infestation. Malhi was of the view that the provincial food department, which is responsible for procurement for decades, should have been prepared for the unpredictable weather condition. It should have come up with an arrangement for drying procured wheat at large rice mills, which have drying facilities to bail out farmers.